A purse with many looks!! Make the Basic Bag. Inside of the bag has coffee card slots, pockets and a zippered pocket. The outside is beautifully pleated - pretty enough to be used alone - - - BUT - - - add a jacket and give it a new look - change it with your mood or the seasons. Make many jackets to accessorize your wardrobe. 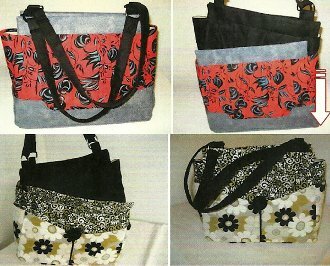 Includes the pattern for the "basic" inner bag and two exterior "jackets".